Composer and guitarist Muriel Anderson was raised in a musical family in Downers Grove, Illinois. Her mother taught piano and her grandfather had played saxophone in John Philip Sousa's band. Muriel fell in love with the guitar at age ten and learned every style available to her, culminating in classical guitar study at DePaul University. She went on to study with classical virtuoso Christopher Parkening and with Nashville legend Chet Atkins. In 1989 Muriel became the first woman to win the National Fingerpicking Guitar Championship in Winfield, Kansas. Muriel has released several CD's: "Heartstrings, Arioso from Paris, Hometown Live, A Little Christmas Gift" with French guitarist Jean-Felix Lalanne, and "Le Duet". She has also released an instructional video and book as well as a transcription book from her recording "Hometown Live". Muriel writes for several guitar magazines and teaches guitar at Belmont University in Nashville. She originated and hosts "Muriel Anderson's All Star Guitar Night" and has performed at Orchestra Hall in Chicago, The Ryman Auditorium and The Grand Ole Opry in Nashville, Tennessee and at The Olympia Theater in Paris. Attention Bluesmen, Rockers, Jazzers, Folksters, Twangers, Fingerpickers, Singer-Songwriters and anybody else that straps a guitar on for work or pleasure � this is a MUST-HAVE guitar course for you! Muriel Anderson's 50 Right-Hand Techniques covers ALL of the essential right-hand techniques: Tone & Motion of Right Hand, Motion of the Thumb, Shaping Fingernails & Picks, Free Stroke, Rest Stroke, Twist & Slice, Flamenco Picado, Planting, Staccato, Arpeggio 4/4 Time, Lullaby Pattern in 3/4 and 4/4, Arpeggio Exercises, Thumb-index Roll, Bouncing the Arm, Fingerpicking Patterns, Alternating Bass with Melody, Scarborough Fair Pattern, Bluegrass Banjo Technique, Chet Atkins Muffled Bass, Merle Travis Bass, Leo Kottke Bass, Easy Strumming Concept, Calypso, Rumba Slap, Golpe, Muted Chord, Ghost Notes, Jazz Picking Technique, Flat-picking Technique, Bluegrass Backup, Bluegrass Backup Variations, Jazz Hybrid Pick-finger, Index-thumb Picking, Chicken Pickin�, Samba Basic, Thumb Up & Down Stroke, Rasqueados, Continuous Rolls, Tremolo Variations, Back of Nail Koto, Feathering Strings, Frailing, Harmonics Overview, Stretching Technique and you even get specific exercises to help your right hand stay balanced and relaxed! Learn, combine and use them all or just keep the course handy as a reference when you dive in to other styles. Either way 50 Right-Hand Techniques You MUST Know will serve you well for your entire guitar playing lifetime! Guitar Lab�s innovative learning systems employ a hands-on approach where students �play� their way through the curriculum using learning tools such as PIP video, practice rhythm tracks, and interactive tab and notation which allows the student to play along with the tab and notation at any tempo without change in pitch! 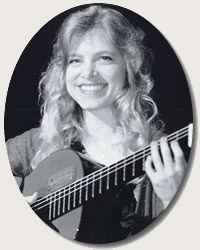 Muriel Anderson, world renowned guitarist and composer, presents this intensive study program for intermediate and advanced fingerstyle guitar players guiding the student through essential theory, techniques and other "tricks of the trade" to enhance the player's performance, arranging and compositional skills. Using several of her own compositions as lesson examples (Arioso, Mister Chester, Two Shores, A Baker's Dozen and the highly popular Angelina Baker Medley), Muriel reveals a variety of her signature techniques and approaches for generating new ideas and fresh arrangements! You'll learn how to flavor your arrangements and compositions with a variety of harmonic techniques including Irish and Cuban influences and odd time signatures. You'll learn how to develop a theme, play expressively and imitate the sounds of a banjo, mandolin or bass. Muriel also demonstrates how to connect notes in a rhythmic tune in the classic style of Chet Atkins. Innovations for Acoustic Guitar will strengthen your fingerstyle technique, enhance your performance and presentation of material, and spark innovative composition and arranging! Hands-on learning tools included with Innovations for Acoustic Guitar: text lesson guide, power tab files, power tab software and bonus material. Secure PIN enclosed in DVD package for quick and secure download of learning tools! Muriel Anderson Plays "Angelina Baker Medley"
Playing her signature nylon string guitar, Muriel Anderson details the classical techniques that allow her to play her spectacular arrangements! You'll learn details that will improve your fingerpicking technique and will discover how to incorporate moving bass lines, cross-string playing, a wide variety of harmonics and other embellishments that will make your guitar arrangements truly outstanding. The powerful instrumentals you'll learn are "Linus & Lucy", the piano theme from the Charlie Brown TV series, "Rosalee", Muriel's tribute to Doc Watson, "Angelina Baker", the show-stopping arrangement of a popular fiddle tune, and John Phillip Sousa's "Liberty Bell March", a true guitar tour de force! In addition to teaching you how to play these great tunes, Muriel outlines essentials, such as nail care, proper sitting positions and other important issues that she brings from the world of classical guitar. Bonus: An outstanding performance of Muriel's signature piece, the great old pop-jazz standard "Nola"! In this beginning fingerstyle course, you'll find the left-hand side of things very familiar and accessible. You�ll dive right into developing that finger/thumb independence on the right-hand and Muriel�s got the educational goods to get you up, running and fingerpicking faster than you can imagine. Guaranteed! In the first section, Muriel focuses on getting your thumb to think for itself by introducing you to thumb circles, the Merle Travis arm, muffling and a few simple alternating bass moves. You�ll then start adding the ring, middle and index fingers to the mix, take on your first fingerstyle tune and ... voila! Muriel then steps you through three accompaniment patterns that you can apply to virtually any tune. You�ll learn how to work the pinky over a G, C and E chord and that will prep you for your second fingerstyle tune, Brad�s Rag. Next up; blue notes, more open chord forms, barre chords, dominant chords, 7th chords, arpeggios, forward rolls, reverse rolls, lullaby, Travis and country patterns. These skills round out your fingerpicking chops and open the door to your new fingerstyle world. But wait... there�s more. Bass runs, chromatic walk-ups and walk-downs, turnarounds, hammer-ons, pull-offs, plus Muriel adds bits and pieces of "Deep River Blues, Ali Cat, Alice�s Restaurant, String Along Rag, Nine Pound Hammer, Windy and Warm, Waterfall in G, and Potato Gun Rag" to your fingerstyle repertoire! Guitar Lab�s innovative learning systems employ a hands-on approach where students �play� their way through the curriculum using learning tools such as PIP video, practice rhythm tracks, and interactive tab and notation which allows the student to play along with the tab and notation at any tempo without change in pitch! This book will teach you how to take a song and arrange it for solo guitar. The step-by-step method and examples give you insight into developing arrangements by ear, adding bass lines, inner voices, arpeggios, block chords, hammer-ons, pull-offs, and embellishing your arrangements. Muriel Anderson gives you the tools you need to create beautiful arrangements of any song - on your own! Songs include: "Freight Train, Wildwood Flower, House of the Rising Sun, Simple Gifts".